Playing fields aren’t just for sports. Geoff Harkness, a sociologist at Morningside College, discusses his research interviewing athletes in the Middle East. 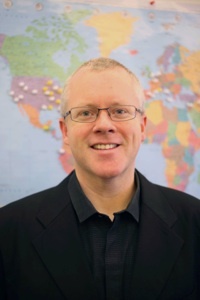 Geoff Harkness is a sociologist interested in culture, stratification, and qualitative methods. His research focuses on interactive micro practices of youth cultures and the role of stratification in shaping culture and identity. His book, Chicago Hustle & Flow, is an ethnography that examines street gangs and rap music through the lens of social class. It was published by University of Minnesota Press in 2014. In 2010, he received his Ph.D. from the Department of Sociology at Northwestern University, and spent three years teaching and conducting research in the Middle East. Currently, Dr. Harkness is an assistant professor of sociology at Morningside College. In 2012, I traveled to northern Iraq to conduct a study of female athletes. At the time, I was teaching and conducting research in Doha, Qatar, so it was a fairly short flight but it was also world’s away. The first thing that surprised me was that northern Iraq was far less socially conservative than Qatar. While women in Qatar tended to wear headscarves and long, black cloaks in public, the female basketball and soccer players I met in Iraq looked and acted similar to college students back in the U.S. Many were religious, but most downplayed the role of religion in their lives. Several were atheists. I was there with the intention of studying how female athletes negotiate their status as both women and athletes in a culture renowned for patriarchy and oppression of females. To my surprise, the women were more interested in discussing the ethnic tensions that occurred on a college campus populated by Arabs, Kurds, and Turkmen. The women brought it up so often during interviews, that I began asking about it deliberately, and by the end ethnicity, rather than gender, became my primary focus. While the campus was fraught with ethnic tension, it seemed as if the basketball court and the soccer pitch served as sites where these conflicts were alleviated, even if momentarily. I’m not implying that sports serve as some sort of panacea for ethnic antagonism, but there was a marked difference in the types of behaviors I witnessed on the courts and pitches, as opposed to other areas of the campus.